Hi, blog readers. Mooky here. Will this semester ever end for Alison? Her last seminar paper was due two days ago, but she got an extension till Monday, so she continues to neglect me (and, let's face it, you a little bit). Honestly, this photo of me -- freaking adorable as it is -- was taken in February. I am looking incredibly handsome today, but she will not take my picture. "Too busy have to work blah blah brabrabra..."
Anyway, she claims to hope that you have a nice weekend, but really, would she even notice if you didn't? Speaking of noticing, have you noticed how handsome I am? Feel free to notice it again. I will now go outside and eat some grass. I will now go outside and eat some grass so I can puke on your bed. That's probably what you really meant to say, right Mooky? ...you're not going by Moukros Moukros-Ghali anymore? Hang in there, Mooks. Post-semester guilt can be very powerful and rewarding. Now go wish your Brainylady good luck! 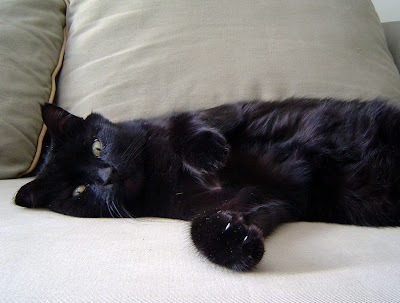 Mooky, you are a fabulous vision of ebony fur. Please go purr at Alison and send some positive cat-ions to spur her on. Oh, Mooky-man! You are, indeed, the most handsome raven-haired feline in all of Quebec! Love those paws, too! Mooky, the way the light reflects off of your shiny coat recalls the purple, blue sky of midnight. How's that for poetic? Dear Mooky - I am sorry to hear that your human is neglecting you so shamefully. I hope you puke some of that grass on her bed - then she'll notice you for sure! I think you are very handsome indeed. Poor Mooky. You don't look half as crazed and insane as my little kitty. Bonjouuuuuur Monsieur Le Mookier! Allez La Brainy! I can relate to the absolutely inexcusible inattentiveness of your human. Really ... priorities now! PS: How do you get your fur so shiny? Damn straight, these women named Alison need to get their priorities in order. What is it with them?! Wow Mooky- You make me nostalgic for the days of "Peaches, Pini, Charlie, Mr.Big Cat , Chat, Minou, smak smak...."
Sure you're handsome, but still neglected, right? Well, there's a thing called "purring on your mistress' lap while she writes her last term paper ever" that should get you noticed. Try it! You never know! Oh! By the way, eating the grass thing is so has been. Hey Mooky... wish Alison good luck with all her work, then consider coming to live with someone who knows how to appreciate a handsome cat like you... meow! What a funny face! And I must say I ONLY approve of vegetarian cats. Good on you Mooky. The rest are just environmental vandals who relentlessly destroy our native birds, marsuipials, reptiles and frogs! Listen, you gotta give the gal a break. She's working very hard, and the less that you cause trouble for her the faster that you will get attention. Lots. of. attention. Now go be a good kitty like the handsome cat we all know you to be. I just looked at your gallery and want to take the day off work today now and raid my sock yarn collection and cast on! Good luck with the paper. Oh by the way, your Mooky looks very much like our Allie. Hope you get some quality time to spend with Mooky (and your knitting) soon! Be patient little furry friend....your so cute she hasn't forgotten you. Let her do her work and there will be more time for you and her knitting!!! You are adorable...I wanna smooch you!! Since you have feline computer savy, you might want to visit us at our blog! Oh, and Allison can come, too!